The global folding cartons market is presently driven by the burgeoning packaged food and beverage industry. Across several parts of the world, changing lifestyle and changing food habits are significant factors for the growth of packaged food and beverage industry. Packaged food manufacturers are adopting rigid packaging solutions that are appealing to consumers and are less likely to get damaged during transportation. However, on the flip side, the availability of sturdy substitutes and low threshold strength of folding cartons due to use of recycled paper are challenging the market’s growth. A report by Transparency Market Research (TMR) estimates the global folding cartons market to rise at a CAGR of 4.7% during the forecast period from 2017 to 2025. 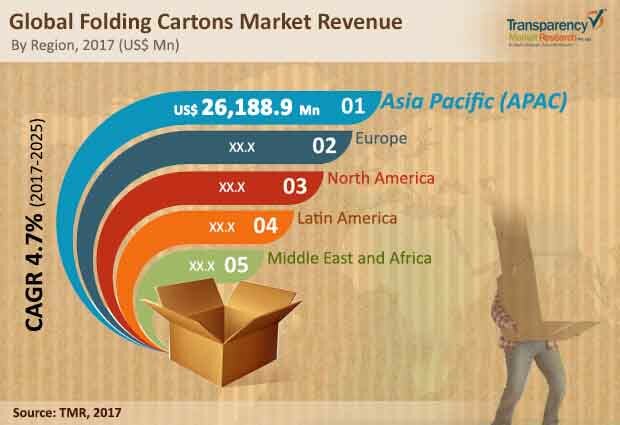 At this pace, the opportunities in the global folding cartons market are estimated to swell up to US$57,692.1 mn by the end of 2017. Vis-à-vis volume, the market is expected to peg a consumption of 29,036’000 tonnes by 2025. By structure type, the global folding cartons market is divided into straight tuck end, reverse tuck end, tuck top auto-bottom, tuck top snap-lock bottom, full seal end, double glued sidewall, and others. On the basis of dimension, folding cartons market is segmented into less than 4 X 1.5 X 6 (Inch), 4 X 1.5 X 6 to 6 X 4 X 10 (Inch), 6 X 4 X 10 to 10 X 6 X 12 (Inch), 10 X 6 X 12 to 12 X 8 X 14 (Inch), and more than 12 X 8 X14 (Inch). Of them, less than 4 X 1.5 X 6 (Inch) segment is estimated to display a CAGR of 4.9% during the forecast period and hold more than 30% market share by the end of 2025. By end-user industry, the global market for folding cartons is segmented into food and beverages, cosmetic and personal care, healthcare, household, institutional, electrical & electronics, and other industry. Of them, food and beverage segment is anticipated to display a prominent 4.9% CAGR between 2017 and 2025; the segment is likely to hold more than 50% share of the market by the end of 2025. In terms of order type, the folding cartons market is bifurcated into customized order and standard order. The customized order segment is likely to register a CAGR of 5.1% over the forecast period and display the leading incremental dollar opportunity in this period. The global folding cartons market can be classified based on region into North America, Europe, Latin America, Asia Pacific, and the Middle East and Africa. Asia Pacific is a prominent region for folding cartons, going forward too the region is anticipated to hold on to its key position. The demand in the region is anticipated to attract a revenue of US$39035.5 mn by the end of 2025. This is mainly because of growth of bakery and confectionery market and surge in number of modern retail outlet. Europe ranks second amongst other key regional markets for folding cartons. The region is expected to display a steep rise in the demand for folding cartons over the forecast period. On the other hand, North America and Latin America are anticipated to account for a collective share of nearly 26.3% by 2025. Key players in the global folding cartons market include Amcor Limited, Westrock Company, Huhtamaki Oyi, KapStone Paper and Packaging Corp., Sonoco Products Company, Georgia-Pacific LLC, Rengo Co. Ltd., Mayr-Melnhof Karton AG, Stora Enso Oyi, AR Packaging Group AB, Oji Holdings Corporation, Pratt Industries Inc., U.S., Corrugated Inc., Great Little Box Company Ltd., Metsa Board Corporation, Graphic Packaging Holding Company, Schur Pack Germany GmbH, Multi Packaging Solutions Inc. This report provides forecast and analysis of folding cartons market on Global level. It provides estimated data of 2017, and forecast data up to 2025 in terms of revenue (US$ Mn) and volume (‘000 Tonnes). The report also includes macroeconomic indicators along with an outlook on folding cartons consumption pattern across the globe. It includes drivers and restraints of the global folding cartons market and their impact on each region during the forecast period. The report also comprises the study of current issues with end users and opportunities for folding cartons manufacturers. It also includes value chain analysis. Market numbers have been estimated based on extensive secondary and primary research, average pricing of folding cartons, by structure type the revenue is derived through regional pricing trends. Market size and forecast for each segment have been provided in the context of global and regional markets. The folding cartons market has been analyzed based on expected demand. Prices considered for the calculation of revenue are average regional prices obtained through primary quotes from numerous regional folding cartons manufacturers, suppliers, and distributors. All key end users have been considered and potential applications have been estimated on the basis of secondary sources and feedback from primary respondents. Country demand patterns have been considered while estimating the market for various end users of folding cartons in the different regions. Top-down approach has been used to estimate the folding cartons market by regions. Global market numbers by structure type, by dimension type, by end use industry, by received order type and by material type have been derived using the bottom-up approach, which is cumulative of each country’s demand. Company-level market share has been derived on the basis of revenues reported by key manufacturers. The market has been forecast based on constant currency rates. In order to provide users of this report with comprehensive view of the market, we have included detailed competitiveness analysis of company players with their SWOT analysis and strategy overview. The dashboard provides detailed comparison of folding cartons manufacturers on parameters such as operating margin, total revenue, product portfolio, and what we call ‘innovation scale’. The study encompasses market attractiveness analysis by structure type, dimension type, end user industry, received order type, material type and region.